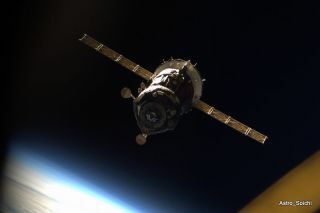 The Russian-built Soyuz TMA-16 spacecraft, as photographed from the inside of the space station by Japanese astronaut Soichi Noguchi, after the ship undocked March 18, 2010. NASA has signed a new $335 million contract with Russia tobuy six extra seats on Soyuz spacecraft to launch ?American and partner astronautsinto space after the space shuttle fleet is retired, the space agency announcedTuesday. The new deal allows NASA to pay the Russian Federal SpaceAgency for six round-trip rides to and from the International Space Station in2013 and 2014. That averages to about $55.8 million per trip ? a slightincrease from the $50 million NASA paid for seats on the Russian-built Soyuzspacecraft through 2012. After NASA's three-orbiter spaceshuttle fleet is retired this fall, American spaceflyers will have to relyon Russia for space transportation until U.S. commercial firms can buildspaceships capable of carrying humans. President Barack Obama is hoping the commercial ventureswill come through. In his 2011 budget request, President Obama proposed thatNASA cancel its current plans for a post-shuttle space vehicle and insteadinvest in the private sector to encourage companies such as SpaceX, VirginGalactic and others to develop spacecraft to carry astronauts to low-Earthorbit. That would free the agency to focus on more ambitious missions to themoon, asteroids or Mars, NASA officials have said. The spaceshuttle Discovery is in orbit today on one of NASA?s final four shuttle missionsscheduled before the fleet retires. The new contract with Russia doesn't mean that NASA iscounting out the commercialspacecraft, said NASA spokesman John Yembrick from the agency'sheadquarters in Washington, D.C.
"We're having redundantservices," he told SPACE.com. "We always plan on purchasing a Soyuzvehicle to make sure we have access to the space station while commercial isprogressing toward cargo and eventually crew capability. We're making sure thatwe're going to have access." Since no commercial firm has yetlaunched humans into space, NASA cannot be sure when to expect alternativeoptions to be ready. And Russia requires a good deal ofadvance notice to make sure it will have Soyuz seats available, Yembrick said. The new contract provides for thesix astronauts to launch on four Soyuz vehicles in 2013 and return on twovehicles in 2013 and two in 2014. That will allow for roughly the same numberof NASA crew members on the space station in 2013 as there are now. "Right now we're keeping thecrew of six with our partners and Russia to the same level it is now," Yembricksaid, explaining that future spacestation crews will be composed of roughly thesame proportions of Americans, Russians, Europeans, Canadians, and Japanese asthey are now. The contract also covers necessaryastronaut training and preparation for the flights, and crew rescue if it isneeded. The fee allows each astronaut to pack about 110 pounds (50 kilograms)of cargo on the trip up to space, and about 37 pounds (17 kg) for the returntrip, plus trash. NASA already has contracts in place with two Americancompanies to provide unmanned cargo shipments to the space station in upcomingyears. The space agency has agreed to pay the California-basedcompany Space Exploration Technologies (SpaceX) a total of $1.6 billion for 12cargo delivery flights to the station using its Falcon 9 rockets and Dragonspace capsules. The first Falcon 9 rocket is targeted to fly a test mission onMay 8. SpaceX officials have said in the past that its Dragoncapsule has been designed to function as a crewed vehicle as well. NASA has also signed a $1.9 billion deal with OrbitalSciences of Virginia for eight cargo shipments using the company?s unmannedCygnus spacecraft and its Taurus 2 rocket. The first flight of a Cygnus vehicleis targeted for 2011. SPACE.com is providing complete coverage of Discovery'sSTS-131 mission to the International Space Station with Managing Editor TariqMalik and Senior Writer Clara Moskowitz based in New York. Click here for shuttlemission updates and a link to NASA TV.